Did you know that this Sunday is the busiest holiday card shopping day of the year? Apparently, it’s true! I actually just finished making our Christmas cards, and I’m excited about this amazing offer from Tiny Prints. They have such great cards, and it is super easy to create and customize them to your liking. So far this is the best deal that I have seen on Tiny Prints Holiday cards so far this season – in part because of the free shipping. I just placed my order using this code and saved $70 off of my order of 75 cards. I compared this code to the other offers I have received and this was my best bet. For 24 hours only, you can get 40% off your order of ANY size plus FREE shipping! 1. 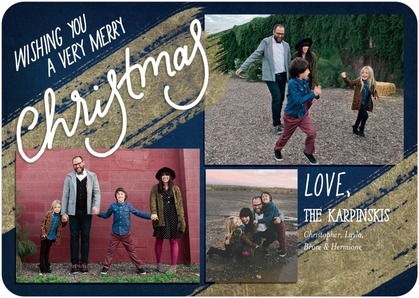 Go to Tiny Prints and select from hundreds of holiday cards. 2. Personalize your card with your pictures, your text, etc. 3. When you checkout, use the promo code TPCARDS40FS to save 40% and free shipping. This promotion is only valid from 3:00pm EST on Saturday 12/6/14 to 3:00pm EST on Sunday 12/7/14, so act fast if you want to take advantage of this great promotion! Fine print: Offer expires 12/7/2014 (12:00 P.M. PT). Save 40% off and enjoy free Standard or USPS Shipping for Holiday card orders using the code TPCARDS40FS at checkout. Shipping offer applies to non-sample orders shipped to a location within the 48 contiguous United States. Shipping offer applies to Standard Shipping rates only. Offer applies exclusively to Holiday cards and is not applicable to previously placed orders, taxes, rush processing charges, foil stamped, letterpress, and laser-cut cards, calendars, photo books, gift certificates, personalized postage stamps and Erin Condren weekly planners. This promotion code cannot be combined with other offers. Offer is only valid on Tinyprints.com and is not applicable on third party or partner websites. To prevent fraud or abuse, we reserve the right to discontinue or modify this offer or cancel any order. Find more retail deals here. You can also search for online retail coupon codes here!